The Wayne County Historical Society recently received a wonderful donation of meticulously hand-drawn home landscape plans for a number of Wooster-area properties from Nancy Welty Clark. 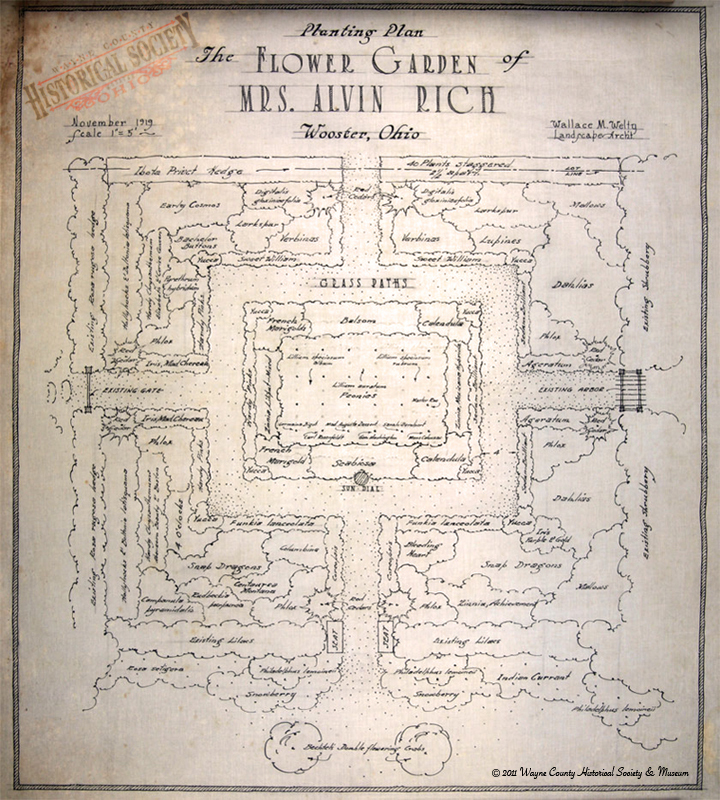 She is the daughter of prominent landscape architect, Wallace M. Welty, who designed landscapes for many large private estates, not only in Ohio, but across the Midwest: Illinois, Indiana, Iowa, Wisconsin, and as far south as Atlanta, Georgia for two properties in 1916. In Lake County Ohio Mr. Welty sketched plans for the Hawthorne Melody Farm and Spinney Run Farm, which are now part of the Lake Villa Historical Society collection. 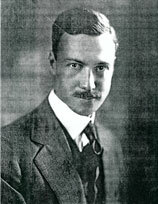 In Wooster, Welty drew plans for a number of well-known local area people and their properties between 1919 and 1920: Joseph W. Hooke-1105 Quinby Ave., George Blake-1320 Quinby Ave., Dr. Edgar C. Reed-SE Corner of Quinby and Wayne Ave., Dr. George W. Ryall-324 N. Market St., William Annat-558 N. Market St., Nancy J. Platter-College Ave., Robert C. Taylor-428 N. Bever St., W.R. Curry-1152 Quinby Ave., Bert M. Bevington-1044 Quinby Ave., and Mrs. Alvin Rich-1118 Quinby Ave. 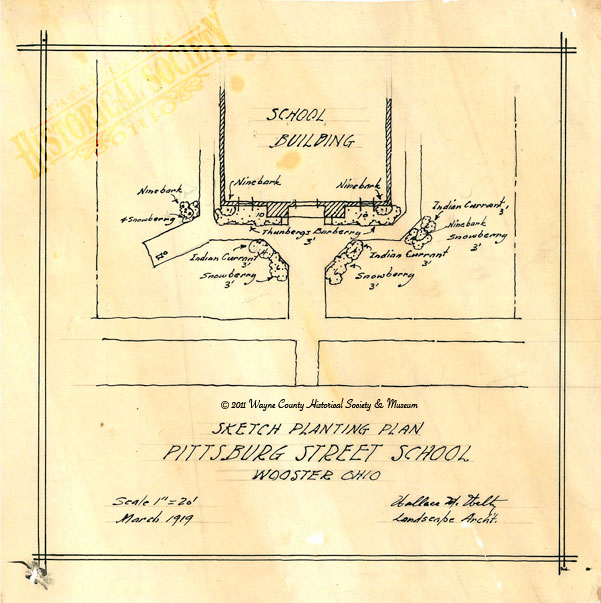 While he was in town, he also did a few landscape designs for a few of the Wooster city schools: Wooster High School, Beall Ave. School, Bowman St. School, Pittsburgh Ave. School, and the Walnut St. School. Whether the property owners ever actually implemented any of these grand landscape plans from the roaring 1920s is unknown but there are remnants and indications that a few of the property owners may have planted some of his suggestions. These are outstanding! Thank You. Awesome Landscaping plans! They were nicely preserved from those good old day, isn’t it. Very nicely detailed and one can tell right away the Mr. Welty had some great talent. In those days they did not have any computers and everything had to be done by hand. Simply amazing and wonderful! Aren’t we rotten spoiled, or what! Thanks for sharing this.